When an author squashes a disparate group of passengers from a luxury ocean liner into a small lifeboat and sets them adrift in a mid Atlantic, it’s likely a high quota of the narrative will feature tales of endurance against the elements and hostilities between the survivors. As the castaways in The Lighthouse see hopes of an early rescue fade, their struggle for survival takes on a far more menacing aspect. For some of them to survive, some of them must die. Who gets to live in those circumstances? Who deserves to die? And who has the right to make those decisions? 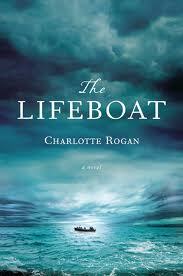 Those questions lie at the heart of Charlotte Rogan’s debut novel. It’s an extraordinarily intense narrative told through the eyes of one passenger, twenty-two- year-old Grace Winter. Newly-married Grace is onboard the luxury liner Empress Alexandra when it sinks after a mysterious explosion. Her rich banker husband Henry dies but Grace manages to squeeze into an already-overloaded lifeboat minutes before it pushes away from the wreckage, ignoring the screams of other passengers fighting to stay afloat in the icy waters. Against all the odds, some passengers from Lifeboat 14 do survive. I’m not giving away any spoilers here because the book actually opens with Grace on trial for murder. Her account of almost three weeks at sea is a retrospective journal written on the advice of her defence lawyer. How much can we trust her version of events which culminates in the murder of Captain Hardie, the only trained sailor on Lifeboat 14? We know she is a single-minded woman; one of life’s natural survivors (her surname may be a hint to her true character). Even her marriage was the result of a determined effort to track down and marry a wealthy young man so she wouldn’t face a life of poverty after her father’s bankruptcy and suicide. In the lifeboat she is similarly astute; carefully navigating the politics over who sits where, finely judging the nature of each passenger and questioning the Captain’s account of what happened on the Empress Alexandra. Whether she convinces the jury of her innocence is something you’ll have to read the book to discover. But she doesn’t convince her fellow passengers “You’re not as weak as you pretend to be,” hisses her co-defendent Hannah at one point during the trial. Innocent or guilty, in Grace Winter, Charlotte Rogan has created a character of tremendous psychological power; a character whose true nature remains a mystery to the end. It’s a tremendous read. One definitely not to be missed.